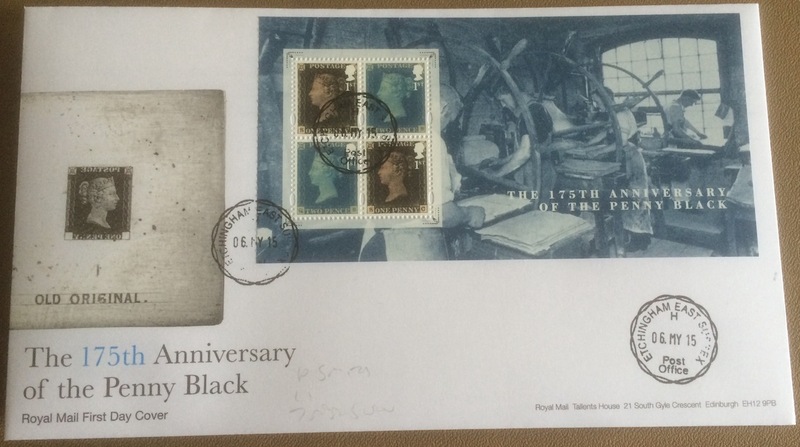 A number of readers have sent pictures of covers - some of them unique - that they produced to mark the 175th anniversary of the Penny Black in May this year. Of course with the Penny Black having previously been commemorated there was the opportunity for double-dated covers. I didn't get the opportunity to produce one myself, but Robert sent this which has the 2015 Penny Black doubled on Venezuela's 1980 stamp marking the centenary of the death of Rowland Hill. A dedicated group of FDC collectors like to have their covers cancelled with the counter datestamp (CDS) of an associated town or village. I must admit the connection with Etchingham was not known to me, but these are nice covers of the miniature sheet and the booklet stamps. Henry Corbould FSA, the designer of the first postage stamp, the Penny Black, died at Hurst Green, having been taken ill there while travelling back to London from the coast, and was buried in Etchingham parish church. There is a memorial tablet on the wall of the church, which for many years was believed to be the only known likeness of Corbould. In 1990, as part of the 150th anniversary of the postage stamp, the village produced two First Day Covers to mark the Corbould connection, and held the Etchingham Stamp Festival to raise funds for church repairs. 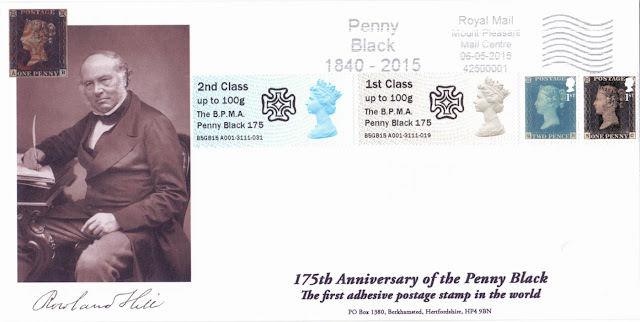 As previously mentioned, the Penny Black slogan postmark was available and announced for the day of issue. Thanks to JE for these pictures of ordinary covers prepared at Preston to get the slogan on the two stamps from the miniature sheet. Also shown one from Norwich which uses the other configuration. 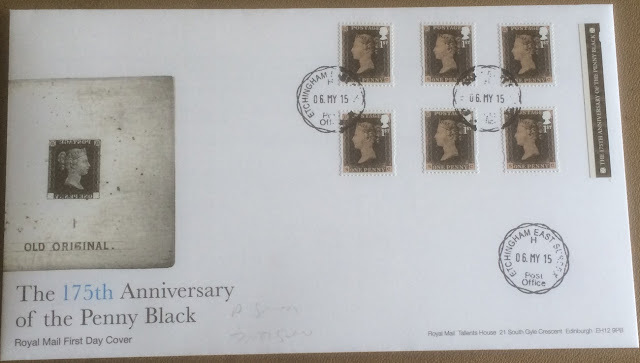 Finally, this excellent combination cover from AB has the two stamps from the miniature sheet alongside the 1st class and 2nd class Post and Go stamps from the BPMA with their additional BPMA commemorative inscription, just tied with the Mount Pleasant Mail Centre Penny Black 1840-2015 slogan. Thank you to everybody who sent in material, and I am sorry that I didn't manage to publish it earlier. 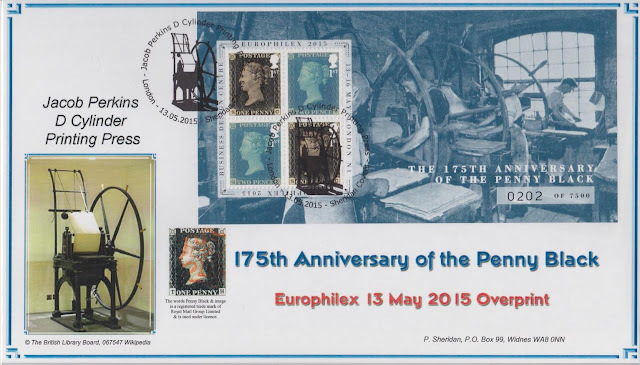 I have been reminded of a couple of covers of the Europhilex Special Edition miniature sheet. 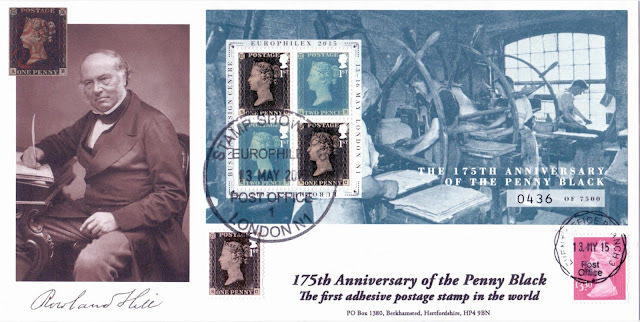 Firstly from AB, using the same cover as above, but the special stamps cancelled with the Europhilex Stamp Show Post Office on the first day of the show, and the Machin definitive cancelled with the Event Office Branch 3 self-inking datestamp. 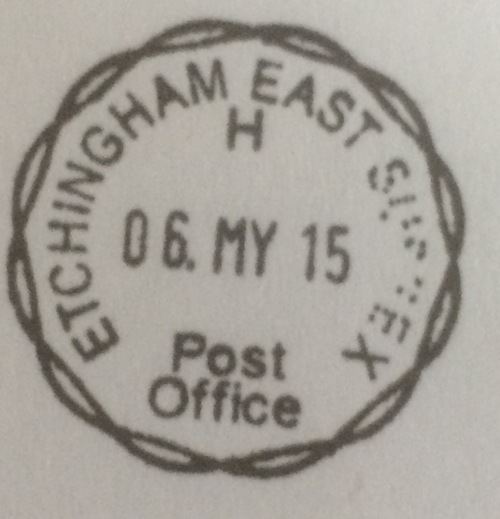 This one is also regarded as official because the cover was produced by the handstamp sponsor (AB), but the Berkhamsted handstamp was not specific to this sheet, actually running for 6 months. § - Association of GB FDC Collectors definition: a first day cover, bearing a set or miniature sheet, produced by the sponsor of the special posttmark. The special postmark on the Sheridan Cover has the same design as the cover. Internet Stamps did not sponsor a postmark for 13 May other than for the Heraldic Beasts Post and Go stamps. So by the definition of "a FDC produced by the sponsor of the special postmark" I don't think whatever they did qualifies. I believe Rushstamps also produced FDCs of the Exhibition sheet.